With all the amazing prints out there, I thought this’d be a great way to share my favorites from the current crop, and let y’all peek into the style and aesthetic that will be Whipstitch. Expect more of the same quality and yumminess as time goes on!! Oh, and take the time to post your responses to the poll in the sidebar–I’ll share the results after Labor Day. I like Michael Miller’s take on it, and the idea that reviving that iconic image of America means going back to the Fifties for us. Such pure simplicity–at least, in retrospect. 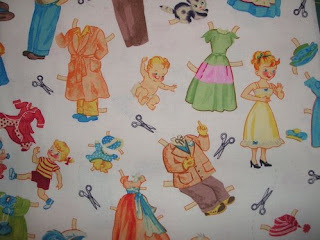 And paperdolls? Never a wrong choice. This fabric is currently available online as an auction on eBay, and SOON in the Whipstitch online store. See y’all at the cutting table! Welcome to the blog of the future Whipstitch Lounge! I’m planning a fabric store and sew lounge in the heart of Atlanta, and am so excited to see these plans develop. Here, in the very early initial planning stages, I’m still developing ideas and settling on a location–but couldn’t wait to write about the experience of starting this place and watching it take on a life of its own! I’ve been teaching sewing for a number of years now, and have been pleasantly surprised at the new numbers of women who are interested in learning how to sew. Sewing has been, for years and years and years, viewed as an “old lady” pastime, not something that hip urban women pursued. For a variety of reasons (and in the interest of putting my graduate degree in Anthropology to work, I’ll be exploring those here as we go along), now women in their 20s and 30s with chic tastes and modern sensibilities have taken up the craft and are starting a real revolution. As I teach my classes I see more and more gaps in what is available for these women in terms of resources: places to learn, to meet other women who sew and craft, to locate great fabrics, to find a community. That’s what I want to build at Whipstitch, and make for us here in Atlanta. I can’t wait to see it all come together, and I’m glad you’re along for the ride! Keep checking back as it grows and builds–big, big things are in store!